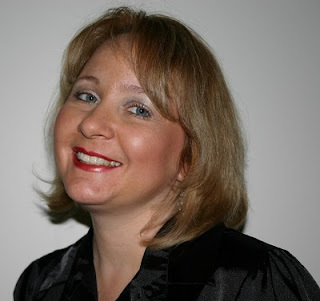 I've really been enjoying the interviews and postings with Sharon all around the blogosphere. Thanks for hosting your interview and giveaway! Oh, and if it's allowed, I would like to enter for only Books 1 & 2 in the series, as I've won Book 3 in another contest. Thanks! Google alerts again, Laura? LOL! Good morning ladies! I am still extremely bleary-eyed. The espresso will kick in soon. Please enter me in the giveaway! :) I haven't read any Pride & Prejudice sequels yet, and these sound lovely. Thanks so much for checking in and reading the review. Best of luck in the giveaway! Sharon, I would like to ask - - if you've seen any other adaptations of P&P and if so, who in your opinion is the best Mr. Darcy? Will it be Matthew McFadyen? Colin Firth? Elliot Cowan? David Rintoul? Or Laurence Olivier? Inquiring minds (otherwise known as me) would love to know! Great question Lori! I would be happy to answer as I definitely DO have an opinion - Ha! - but I have to dash. I will be back after noon my time and will frankly share my thoughts on the Darcys. Hi Katy! If I may be so bold, my sequels are the best! LOL! Lori, I thought you had some good questions. Sharon, I'm really enjoying the blog tour. I think I'm becoming an addict. Looking forward to more. Thank you for the blog, I really enjoy it. I just want to say that I'm a big fan of your work . I have read all your books, and I love them and have recommend them to everyone I came across. I can’t wait for your next book to come out. My question is, can you give us a synopsis on your fourth book? I really like to know? I've used Sharon's Regency page as a resource for my own writing. This was a very interesting interview. Finally home where it is warm. Man, way too cold and wet right now! OK, to Lori's question, and I am prepared for a few rotten tomatoes! I have seen the BBC version of P&P and "Lost in Austen" so those are the only other 2 Mr. Darcys besides Matthew Macfadyen that I can compare. Matthew was the first I ever saw and it is no secret that he is my inspiration and that I felt he was perfect. Was he exactly what Austen imagined? That is open to interpretation, I believe. Whether one agrees with the shy, vulnerable, socially inept version of Mr. Darcy as one way to interpret the text or not, it still does not change that Matthew played the role amazingly. He was a hero I could relate to and fell in love with. Colin Firth was a huge disappointment to me. Obviously I saw that version after the movie (the next day, in fact) so I expected to see a similar softness of character. Firth played a perfect arrogant Darcy. He was brilliant at that part. Brilliant at haughty and obnoxiously proud. But, for me, I never felt the struggle, the love, the passion, the loss, and so on that Matthew put into the role. In the end I just did not get that giddy feeling of these two people being wildly in love and perfect for each other. Hope that wasn't too much! Thanks Eliza! I always love to hear from a fan! Romancing Mr. Darcy follows along immediately where My Dearest Mr. Darcy ends. Christmas events, the christening, and the masque are covered with some startling surprises and drama. After that time moves on a bit faster. In fact, just over a year is covered. Romance for several secondary characters is explored, the stage is set for the return of Wickham, Lizzy and Georgiana are presented at Court, Georgiana debuts, Lizzy and Darcy take another vacation this time finally going to the Peaks, and so much more! More news will be revealed in the months ahead. I am working on first edits right now! Hi Mary! I am so happy the Glossary has helped you! Wow. What a great interview, Lori and Sharon! I enjoyed learning more about you and your books since I have yet to read any! I also liked learning about the Christmas novella. Definitely looking forward to learning more about that! Thank you for your honest reply, Sharon. No tomato throwing, I promise! CF was the first Darcy I saw and as you pointed out, I'm sure formats preferences and opinions. He is the best Darcy in my opinion and the scene between him and Elizabeth at Pemberley, when she is at the piano with Georgiana . . . ah, it makes me giddy every time I see it. I too was pleasantly surprised with EC's version. In fact, while I thought he did a stupendous job the first time I saw Lost in Austen, I disliked the production itself. It took a second viewing for me to appreciate everything LIA brought to the genre. Nora, Eliza, Mary and Meredith, many thanks to you for the compliments and stopping by. I hope you enjoyed Sharon's interview as much as I did. Nice Interview Lori! And, I will definitely have to check out Sharon's Pride and Prejudice sequels. I'd like to chime in on the Mr. Darcy issue. I have always been partial to Colin Firth maybe because, like you Lori, I saw this series first. But, I adore the 2005 movie (have seen in tons of times) and love Mathew as Mr. Darcy too. Hmmm, I think there is room for both :). Hi Meredith! I am very excited about the novella too! October and November seem so far away, even to me! Thanks for not throwing tomatoes, Lori! LOL! I really should have been clearer in that I did not dislike how Colin portrayed Darcy. I would agree that in general he was directed to act the role closer to what is typically considered how Austen wrote him. I think some of it does come down to which one you see first. Matthew Macfadyen is so amazing to me, in all his roles. I have become a huge fan. Colin Firth is handsome and a terrific actor, but he just has never "moved" me in the same way. I know that is just my personal taste, but that is the mystery for women! Right? LOL! Lost in Austen takes a proper frame of mind. I knew it was very tongue in cheek, yet I had to watch it twice to fully appreciate how fun it is. I have a hard time letting go of my serious attitude when it comes to these characters! if you were to write a jane austen monster mashup (i.e. pride and prejudice and zombies), what creature would you feature and what would your title be? What a great review- I would love to read these books! I have loved P&P fpr 29 years and the first Darcy I saw was David Rintoul in 1980 version! Yes a very long time ago. Talk about stiff and pompous! But nonetheless I fell in love with him or more rightly DARCY! I have found that through my love of P&P and my all time fav literary couple Darcy & Lizzy, I can appreciate every single interpretation i its own right. I did love Colin's Darcy for so very long, mainly because the TV series did the whole book (6 hours of P&P brilliant). Matthew brings a whole new dimension to JA's Darcy and I must admit I look forward to seeing many more adaptations in the future. In saying all this I know that I LOVE Sharon's Darcy best, for one reason I can imagine him to look exactly how I want. His noble mien is still intact however Sharon breathes new life into Darcy. We get to see how devoted and passionate he really is. The depth of his love to Lizzy is one of the best part of his character. But Sharon also makes him strong, vulnerable and even a bit of a goofball (only briefly). 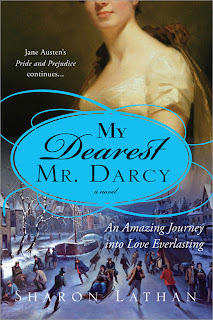 A beautifully perfect picture is painted of Darcy through Sharon's writing. Not perfect but in my mind perfection. I hope everyone enjoys reading Sharon's saga as much as I do! Please enter me!! I've been following Sharon's blog tour and am excited about these books! Thank you for hosting too! ha! i love it sharon - pride and prejudice in middle earth. there could maybe be a tie-in with darcy and a ring??? I would love to win these books. The interview is interesting and I like that she writes about real love the way it should be. I must admit that I've become something of a P & P nut over the past few years (I blame my daughter, who blazed the trail), so I would love to win this giveaway. I loved the interview. I hate to admit it, but I haven't had the opportunity to read any of Sharon's books yet. I think that this would be a good start. I absolutely love P&P, and I've been eyeing these books for a while now. Would love the chance to win them all! What a great giveaway! I'd love to be entered. This is a great giveaway! Thanks for hosting it! This set looks great. I'd love to be entered. That was a great interview! I'd love to win this book set! Extensive review! Great insights... Please count me in. Thank you! Oh, can't wait to hear who is her favorite Mr. Darcy. Mine is Colin Firth. Oh please do enter me to win! I have been following the dialogue and must say the only adaptation of Pride and Predjudice I truly enjoyed immensely was the 1940 version where the wonderful Sir Laurence Olivier played Mr. Darcy. The novel is of course, one of m all-time favourite books, but to watch it on telly, it can only be the 1940s version since for me, Sir Laurence Olivier shall always be Mr. Darcy. What a wonderful interview--how interesting about her career in nursing and love of reading eventually led to this writing gig! Please count me in for the giveaway. Thanks. Enter me! Yes, this is outside my realm of what I normally read but I said I was going out of my comfort zone this year in my "To Be Read" stack. I've been wanting to read these! i hope i win!!! What a great interview. I would love the opportunity to be entered into the contest. Any of the books would be great as I have never read any. Enjoyed reading how the author was inspired to write these books. Please enter me. What a wonderful giveaway. I've read the first of this series and really enjoyed it. Nice to learn more about you Sharon, and best of luck with the books. I'd love to read more. Thank you for a fabulous interview and a chance to win these books. I would love a chance to read them. Loved the interview - would love the chance to win this set!